Easter: What is Ash Wednesday 2014? The Christian season of Lent begins with Ash Wednesday. The date of Ash Wednesday varies each year according to the date of Easter. It is always six-and-a-half weeks before Easter. The earliest possible date of Ash Wednesday is 4 February and the latest possible date is 10 March. Ash Wednesday is a Christian festival. It marks the beginning of six and a half weeks of repentance, fasting and abstinence in preparation for the most important Christian festival of Easter. In 2014 Ash Wednesday will be on 5 March. Ashes are something that are left when something is burned. For Christians, ashes are a symbol of being sorry for things they have done wrong and want to get rid of forever. It is also a reminder to them that we all come from ashes, and to ashes we all will return. Why are ashes marked on the forehead? For Christians, the marking on the forehead with ash marks the commitment to Jesus Christ and God. They wanted to show God that they were sorry for the wrong things they had done in the past year. Using a mark on the forehead as a sign of commitment is also used in many Middle Eastern cultures where a round, coloured circle is marked on the forehead. What happens on Ash Wednesday today? Many Christians will attend a religious service where the ashes are blessed by the church leader, and placed on their forehead. Christians believe this marks the physical and spiritual beginning of a personal Lent season in which 40 days of repentance will begin leading up to the celebration of Easter Sunday. The actual moment when the forehead is marked initiates the beginning of lent for each individual person. Why are last years Palm Crosses recycled? Palm Sunday celebrates Jesus's triumphant entry into Jerusalem, so when the crosses used in the last years Palm Sunday service are converted to ashes, worshippers are reminded that defeat and crucifixion swiftly followed triumph. What do the ashes symbolise? 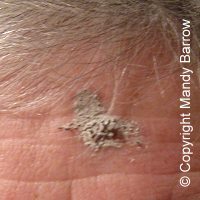 Using ashes to mark the cross on the believer's forehead symbolises that through Christ's death and resurrection, all Christians can be free from sin. I remember putting an ash twig down my sock on Ash Wednesday. This was to keep me safe, as anyone who did not have an ash twig could have their foot stamped on. Do you know about Lent and why it is forty days?